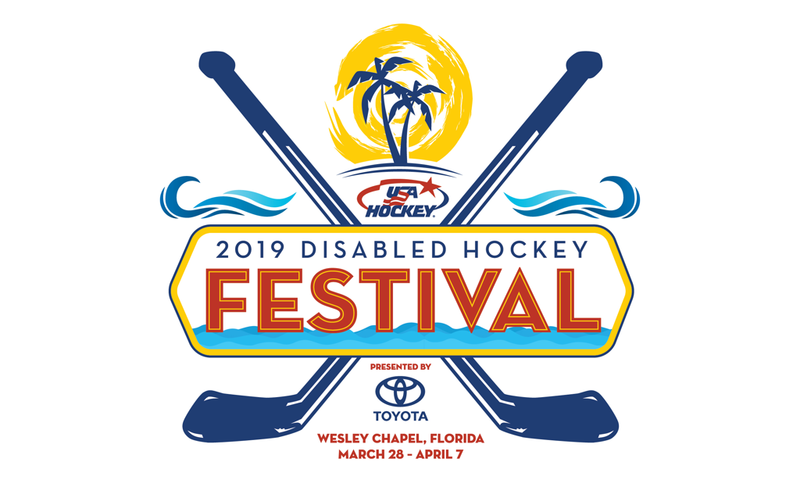 Held in sunny Florida for the first time, the 2019 Toyota-USA Hockey Disabled Hockey Festival, now in its 15th year, continues to see its impact stretch far beyond the ice from which deaf, blind, special, standing/amputee, sled and warrior hockey players skate. A showcase of all six USA Hockey disabled hockey disciplines, the on-ice focal point of the Festival is USA Hockey’s Adult Sled National Championships that features many U.S. Paralympic gold medalists. But, off the ice, the Festival does so much more. Consuelo Sanchez, sports development and tourism manager for Florida’s Sports Coast, the tourism branch of Pasco County, was so moved by the athletes she saw that she had to bring her three daughters to the event. She felt it was that important to show what happens when people aren’t restricted by others. Sanchez said her 11-, 14- and 18-year-old daughters were amazed by what they saw at the Festival in Wesley Chapel, Florida. There were hundreds of athletes who participated in the sled, blind, deaf/hard of hearing, standing/amputee, special and Warrior divisions. And while the Tampa Bay Area may be a hotspot for spring break this time of year, it more than brought out the fans in the hockey community who were unfamiliar with these disciplines. “At first, it was a lot of people didn’t believe me that there was a blind hockey division because [the misconception exists that] it’s impossible for blind people to be able to play hockey,” said Kristen Bowness, co-chair of the Disabled Festival, who is also manager of diversity development and sled hockey for the NHL’s Tampa Bay Lightning. The Tampa Bay region is becoming a hockey hotbed, thanks in no small part to the Lightning. Prior to its monumental President’s Trophy-winning season this year, the Lightning and Tampa Bay area had hosted the 2018 NHL All-Star Game at Amalie Arena, reached a Stanley Cup Final and served as the training facility for the gold medal-winning 2018 U.S. Olympic Women’s Ice Hockey Team. Bowness and Sanchez said spectators and players from non-disabled teams quickly learned how those participating in the Disabled Festival were able to play hockey. In blind hockey, there is an oversized puck that makes noise as it moves on the ice. In deaf hockey, the lights flicker to indicate a referee’s whistle. Players with lower body disabilities compete in sleds while some of the standing/amputee players use prosthetics. Already a huge event, Bowness feels it will continue to evolve and grow. While Sanchez is still calculating the economic impact of the Festival, there is no doubt from her side that her organization wants to be involved with the Festival, and USA Hockey as a whole, in the future. She said the rinks were packed both weekends and there was extensive media coverage because of the uniqueness of the Festival. And it is an event that will stick with Sanchez for quite a while.